Words or pictures on the LED Writing Board will be shined by 7 different neon lights and there are 52 kinds of flashing functions. Also, you can alter your words or pictures any time for creating the most beautiful achievement on your own. The brightness and colors of theproduct are gorgeous. Because of this, achievements of your creation will be more attractive to customers in the day or night. This product passed "CE", "ROHS", "PSE", "UL", "SGS". 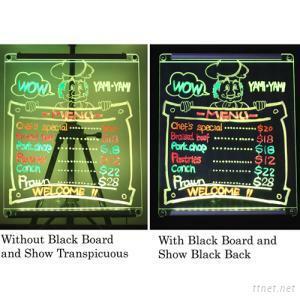 1 SANFUSIN Light Slate Led Writing Board is made in Taiwan. Fashionable, highly pervious to light, shatterproof and scratch proof. 3. 7 color LED lights. 4. 52 different lighting functions. 5. The content can be changed easily. 7. Applications include: pizzeria, restaurant, shop, bar, pub, night club, party, etc.